TIPP CITY — The Southwest Ohio Chapter of JDRF is proud to announce Sofia Maggard from Tipp City was selected to be a member of the JDRF Youth Ambassador program for the 2017-18 school year. This program accepts applicants among children who have type 1 diabetes (T1D) and who set a great example for others living with the disease. Sofia was diagnosed with T1D at the age of 2 and goes above and beyond through their support of JDRF and dedicated commitment to fundraising for research to find a cure. Sofia Maggard is 12-years-old and is in seventh grade at Tippecanoe Middle School. The Youth Ambassador Program was created to empower children with T1D by giving them the opportunity to provide diabetes education to the public. 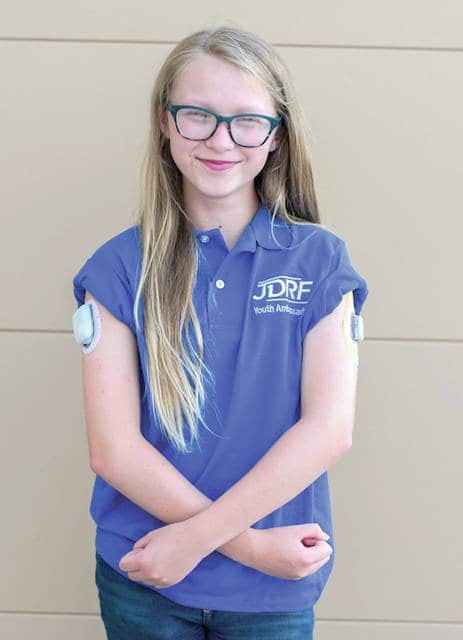 Sofia is the only T1D in 7th grade at Tipp Middle School and one of an estimated 30,800 residents of the Greater Cincinnati area who live with T1D. An autoimmune disease where the body destroys its own insulin-producing beta cells in the pancreas, T1D is often misunderstood, which is why the awareness-building aspect of the Youth Ambassador role is so important. During the next year, Sofia will provide health education throughout the community to raise support and awareness of type 1 diabetes. She will speak to businesses, schools, and hospitals, as well as participate in JDRF sanctioned outreach events. Youth Ambassadors have a positive outlook on life and diabetes, and also represent JDRF at various local events. JDRF is the leading global organization focused on type 1 diabetes (T1D) research. Driven by passionate, grassroots volunteers connected to children, adolescents, and adults with this disease, JDRF is now the largest charitable supporter of T1D research. JDRF collaborates with a wide spectrum of partners who share this goal. Since its founding in 1970, JDRF has awarded more than $1.6 billion to diabetes research. More than 80 percent of JDRF’s expenditures directly support research and research-related education. For more information about the JDRF Southwest Ohio Youth Ambassador Program, visit ​swojdrf.org ​or call (513) 793-3223.